When it comes time to plan your spring break trip, the 2017 Toyota Avalon is so comfortable that you’ll be happy to drive all the way south to the sun and sand and back again. When you want the ride to be as quiet as a whisper, then you’ll love driving the new Avalon at highway speeds while enjoying the superior sound of the onboard entertainment system rather than wind noise. The Avalon’s cabin keeps out road noise while being acoustically designed to enhance the sound system that boasts either nine or 11 speakers and delivers crystal clear sound from your choice of AM/FM or CD player. The 7-inch touch screen audio system supports SiriusXM® satellite radio, Gracenote® Album Cover Art and provides you with USB ports, aux input jacks and Bluetooth® hands-free connectivity for your cellphone. Everything you could possibly want for long distance travelling resides on the dash of the Avalon. The LTD 6A model includes a wireless smartphone charging station. In addition, there is an available navigation system to keep you on track and audio controls mounted on the steering wheel to keep you focused on the road. The 2017 Avalon comes in two models and both are fully-equipped with luxurious features like a driver’s seat with eight adjustable positions, lumbar support, recline adjustment and memory position for a quick return to your favourite position after someone else has driven the car. Both models feature heated front seats for cold winter driving, and the LTD 6A model includes a heated rear bench seat to keep your passengers warm. It also has rear seat climate control options. The 2017 Avalon comfortably seats five, which makes it a great car to take cross-country trips in. Being comfy while driving is certainly a plus, but there are many other features in the Avalon that make it easy to drive. Push button start is so much easier than fumbling for a set of keys. Map pockets on the doors let you put your maps, park brochures, roadside attractions and other travel information in a safe place. A coat rack keeps your coat handy for the times when you need to get out of your comfortable and controlled environment. Cup holders in the front and rear let everyone enjoy their favourite beverage. A cargo net keeps everything that you place in the truck secure in its spot. When you get home, the integrated garage door opener gets you inside safely and securely. Toyota has developed a suite of safety features that are all designed to communicate with each other. The Toyota Safety Sense (TSS-P)™ incorporates the latest technology to develop features that stay alert when you don’t. Dynamic Radar Cruise Control uses radar to adjust the cruise control when it detects upcoming traffic. Lane Departure Alert lets you know if you start to drift from your lane and the steering assist will correct your position if needed. The Pre-Collision System alerts you to a stopped vehicle or a pedestrian and employs automatic braking if you don’t react. Automatic high beams switch back to low if they detect oncoming traffic. All are standard on both models. Other safety features include airbags, vehicle stability system, traction control, ABS, EBD and Smart Stop Technology. No matter where your trip takes you, the 2017 Toyota Avalon will make it enjoyable. 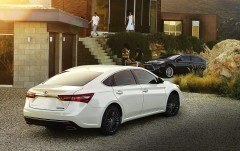 Come by and test drive a new Avalon today.